Yes, the sheer size of the cities has already earned me respect. Of course China is a big country with a huge population The numbers are hard for me to grasp: Nanjing, the first stop on our journey, has more than ten million inhabitants – and doesn’t even make it into the top ten Chinese cities. Our guide in Hangzhou, about 300 km southeast, even speaks of a „manageable size“ of his metropolis – only about nine million – and its location as a green city at the West Lake. That’s why many people living in Shanghai come to Hangzhou to enjoy a stroll in nature on weekends. They use the express train, which takes just 54 minutes for the 200 kilometers. I was quite impressed by the rapid transit network and the huge train stations that resemble modern airports. The trains run at close intervals and are also very punctual. With concern for punctuality, our guide also asks us not to dawdle when boarding since the stop is calculated with two minutes sharp. But that also works. After all, the cars stop in the specified order and exactly at the specified spot at the platform. You think you’re in Switzerland. Oh yes – one more thing: You can only get into the stations with a valid ticket, because the many entrance doors are already being checked carefully. And you can only leave the station with a valid ticket, so better be aware to keep your ticket while travelling in China to the very end of your journey. That’s how ´you´ keep the overview – however, respect for the perfect management of such a large infrastructure. 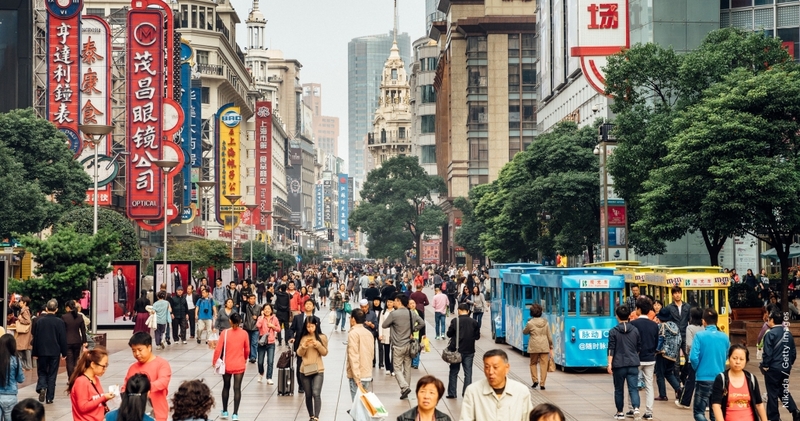 Let’s get back to the big numbers: Shanghai has almost 27 million people. Yes, we’ve learned that already, but did we actually get it? I found our last stop even more astonishing. Shenzhen – 40 years ago still a sleepy fishing town with about 30,000 inhabitants. Today, Shenzhen, the special economic zone north of Hong Kong, has almost 20 million inhabitants. This means that this „city“ has more than twice as many inhabitants as our entire federal state of Baden-Wuerttemberg. And the region, formerly known as the „factory of the world“, has now become a breeding ground and hub for R&D with a worldwide reputation. This development was deliberately promoted by the government in Beijing. No wonder, then, that two of the world’s largest Internet and IT companies have their headquarters here today: The network supplier and mobile phone producer Huawei, currently on everyone’s lips, as well as Tencent, provider of the WeChat multifunction app, which is the most widespread app in China. Not only is it used for chatting, you can also order a taxi and make appointments with your doctor. But above all, you pay by WeChat – or with the competitor product AliPay from the other large corporation Alibaba. In Germany many regional savings banks are still trying to bring their own pay apps onto the market. Because of customer loyalty?! Today Shenzhen is part of a truly gigantic city cluster in the southern province of Guangdong. And somehow it reminded me of Silicon Valley. 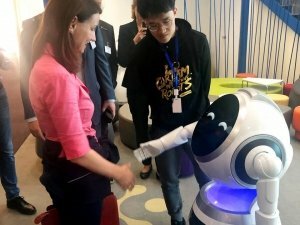 The buildings are very modern with a large number of companies and start-ups that deal with state-of-the-art technology such as artificial intelligence, image recognition and processing, and robotics. Even from kindergarten on, kids learn how to handle robots and AI in a playful way. Nobody is obviously bothered by the fact that UB-Tech, a manufacturer of robot software, also develops and offers teaching aids for the various school levels right up to college. On the one hand, the company is creating demand on the sales market for its age-appropriate robot models. On the other hand, it takes care of the qualification of junior programmers in a playful way. A smart double strategy and once more big thinking. The atmosphere in Shenzhen is noticeably good and very positive. The companies we met and talked to have courage and self-confidence, which is similar to Silicon Valley. However, it gives me a more down-to-earth, sympathetic impression than many American champions tend to show: confidence mixed with a touch of humility – a very pleasant and appealing mix. And something else resembles the Valley. Here you can see blue skies and palm trees, taxis and buses buzzing through the huge city with electric drive. And while my favourite city, Toronto, which is also located in a bay, has been trying for years to relieve Lakeshore Drive of traffic and make it an inspiring environment for people to live in, the Chinese planners have once again proven their vision. 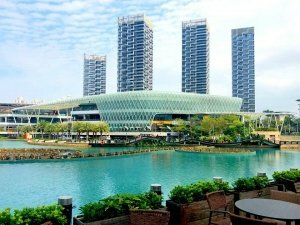 Along the entire bay of Shenzhen – that’s more than 30 kilometers – there is a very well-kept public park. That brings me to my next point of respect. Of course, we find it difficult to understand a planned economy as a promising concept. And we also have a hard time with the fact that in many Chinese cities everything and everyone is completely monitored by video. The social scoring often described in this context naturally arouses very mixed feelings in me too. I am certain, that China has very talented planners and people with foresight. A large public park is of course a very valuable asset for such a large metropolitan area. And whether there would be such a thing without ordering power? Did „the market“ manage something like that even in our cities? The Chinese think and plan big – and they decide and implement. And that with a lot of energy and money – but above all pretty speedy. I took that with me as one of the central impressions and qualities of this trip to China. I have discovered another very exciting kind of respect. In the past, we liked to talk about Chinese piracy. 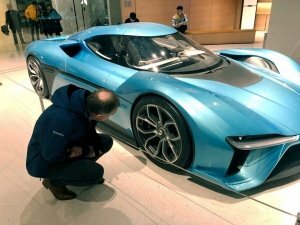 „They come to the IAA (Frankfurt Motor Show), take pictures of our cars and just copy them.“ That’s right, the Chinese didn’t deny this fact at all at any time. It was already an expression of respect for the German Automobile Industry. In the meantime, they do very well. Many of the cars we saw during our visits to Geely, BYD, NIO and World Champion (yes, that’s the name of one of the up-and-coming Chinese manufacturers, nomen est omen!) are at eye level in terms of workmanship and feel. And here, too, the Chinese think big and in „use cases“. Rarely is it just about the new electric model, no they think in „car and home connectivity“ (Weltmeister) and „communities and lifestyle branding“ (NIO). 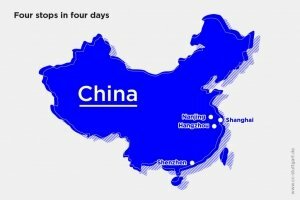 If you look at the minds behind these concepts, you can see that many of the Chinese CEOs, CIOs, CTOs or whatever you like to call the driving minds of the companies, have studied in the USA and/or worked for German suppliers and OEMs and collected important knowledge and experiences. The question arises: Do we even have a chance? I believe that respect also offers an opportunity. We should respect the Chinese as partners at eye level as they do with us. How do I make that happen? In a conversation I had with Geely’s press officer during the visit, I asked him why and how Geely actually managed to put Volvo back on track for success. And again the term „respect“ came up. He said the Chinese investors had refrained from telling Volvo people after the takeover what and how to do it. They obviously had respect for their engineering and management skills. Naturally, they wanted to see plans and also set targets. But they had given the management a relatively long leash and so Volvo had been able to work out its qualities again in Chinese hands and reposition itself for the future. And that was just as completely different as it was, for example, with the rather less successful acquisition and integration of Saab by GM. As so often, it would probably be good if we could blend together the best of both worlds. I think we would do well to adapt the dynamics and the great thinking and planning of the Chinese. At the same time we should remember that this is also one of our strengths: to think conceptually fast and in systems. If we stay in close contact with the young technology drivers in China, we will certainly be able to bring in the undeniable benefits of our thoughtfulness and Western values. So does it finally come down to a question of respect?